The Hobbit: An Unexpected Journey will be in theaters this December 14th, and we have been patiently and anxiously been waiting. We were thrilled knowing there would be two parts to The Hobbit, but when Peter Jackson announced there would be three parts, we were filled with greater excitement. Warner Bros Pictures and Metro-Goldwyn-Mayer Pictures jointly announced that the final film in Peter Jackson’s trilogy adaptation of the enduringly popular masterpiece The Hobbit, by J.R.R. Tolkien, now titled “The Hobbit: There and Back Again,” will be released worldwide on July 18, 2014. The Studios also announced the title of the second installment in the franchise, “The Hobbit: The Desolation of Smaug,” which will be released on December 13, 2013. 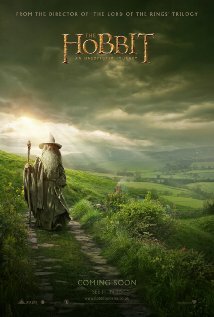 The first film in the trilogy, “The Hobbit: An Unexpected Journey,” opens this holiday season, on December 14, 2012. We are very excited to hear the titles and with less than three months until the release of The Hobbit: An Unexpected Journey, we look forward to the updates and news to come and we will share it as it comes!